Bears are typically pretty scary. They're big, hairy beasts. But baby bears can do some cute things, including on the golf course. 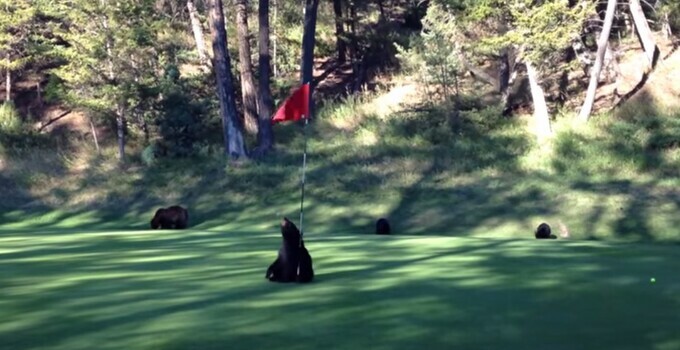 Several bears wandered onto the Mountainside Golf Course at the Fairmont Hot Springs Resort in Vancouver, British Columbia, forcing players to evacuate the green on which they were about to putt. One bear in particular walks onto the green and plants himself near the flagstick, using it as a back-scratcher before realizing it would make a lovely dance partner. After about a minute of delight, the bear takes one of the players' golf balls as a souvenir.